What are the most interesting exhibits for kids at a museum? The ones where you get to punch buttons or touch something to make it go. Make that same experience at home with a food processor or blender (and cook something while you are at it). Watching food change from a solid to a liquid is pretty cool. And kids are much more likely to eat (or at least try) a food that they helped make. So get out the food processor or blender - provide a little adult supervision - and make that thing spin! With a kid away at camp, key moments in my day include a) mail call and b) pictures posted on the web. On Saturday, no pictures were posted and the mailman had not arrived by 5:30pm. We were heading out to dinner so on our way, I drove around the adjacent streets hoping to intercept the mailman. Yes, I was, and still am, one of those moms! I stopped short of emailing camp to ask why no pictures. (A letter finally arrived). I had my own sort of mail call this morning. Friend and TBM reader, Jana, sent an email letting me know that she had made two recipes that were successful: orzo salad and peach cobbler. There are so many recipes and cookbooks out there; the collection on The Baker’s Mann is taste tested and approved (even though not everything made and tested makes it to the blog). I love when you find a recipe that works for you! This week starts the “wonderful world of watermelon” series. What is more refreshing in the summer than watermelon? Try this watermelon bellini which is like a homemade Slurpee for adults (with alcohol) or for kids (non-alcoholic). Cut lime in half. Cut 1 half into wedges, and rub on rims of 8 (6-oz.) cocktail glasses; dip rims in 2 T of sugar to coat. (This step is optional - note that I didn't sugar the rims of my glasses). Place frozen watermelon in a blender. Add 1 cup chilled sparkling wine, 2 T sugar, pinch of salt, and juice from half of lime (or 2 T lemon juice). Blend until smooth. Pour mixture into prepared glasses; top off with additional sparkling wine. Garnish, if desired. Serve immediately (I served it with a straw because it was pretty “thick”). Taking the kids to the movies can be expensive but kids still love them. They also have the capacity to watch the same movies over and over again. At Studio Movie Grill's Children's Summer Series, you can get the theater experience for a few dollars. Kids' tickets are $1; adult tickets are $2. That leaves some extra money for popcorn! The movie changes every week and there is just one showing at 11am, Monday through Friday. There are "younger kid" movie options like "Sesame Street" and "Clifford" and "older kid" options including "Shrek," "How to Train Your Dragon," and "The Lorax." Mom, I'm bored - let's go to the movies! I am addicted to The Next Food Network Star competition. The whole concept is fascinating. These Next Food Network Star wannabes (me) are given a challenge and then an hour or less to come up with, cook and present their dish (not me – read the “About Me” – “I’m no chef (I follow recipes)”). David and I have our favorites (there are 5 contestants remaining. Watch next Sunday 8pm CST and make your pick!) 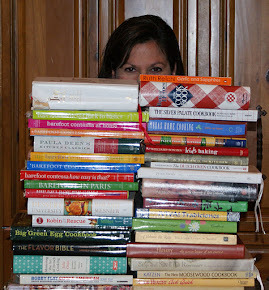 and a few recipes have been enticing enough to try! This pie was made by “The Pie Guy” Rodney Henry. Most of Rodney’s dishes are made into a pie. Different from the pie that he made on the show, it doesn’t have the bacon infused streusel topping but no one was complaining about a traditional lattice crust. The recipe below is a merging of Rodney’s and a similar one from The Joy of Cooking. I have never tried rhubarb. I found it in the vegetable section of Tom Thumb although in 1947 it was declared by a New York court as a fruit. It looks like reddish-pink celery and has a strong, tart taste. Place the oven rack in the lowest position in the oven. Preheat the oven to 425. Put the blackberries, strawberries, rhubarb, and lemon juice into a large bowl. Add the sugar and cornstarch and combine. Place a pie crust into an 8-inch pie pan. Pour the filling into the pie pan. Top with second pie crust and cut slits to allow steam to escape. Or create a lattice crust. * Brush the pie crust with milk; sprinkle sugar (about 2 t) on the moist top crust. Place the pie on the bottom rack (this will allow the pie crust to cook and become crisp even with a very juicy pie filling. Bake at 425 for 30 minutes. After 30 minutes, turn the oven to 350 and place the pie on a baking sheet to catch any juices that bubble over. Cover the crust edges (not the lattice middle) with aluminum foil to slow down the cooking. Cook for another 25-35 minutes. Allow the pie to cool before serving. Even with the cornstarch, the filling will be slightly runny. Serve with whipped cream or vanilla ice cream. The pie is best eaten on the day that it is made. Store leftovers in the refrigerator for one day. *Lattice crust: lay out the pie crust on a cutting board. Cut the pie crust vertically into strips (@1/2 inch). Remove every other strip and place it horizontally. Weave the horizontal strips over and under the vertical strips. Press down slightly where the strips oversect to form a cohesive pie crust. Flip the cutting board over on top of the pie and peel off, if necessary. Center over the pie and crimp the edges with the bottom crust to seal. I offered numerous activities but all Elizabeth wanted to do was to pet a puppy. 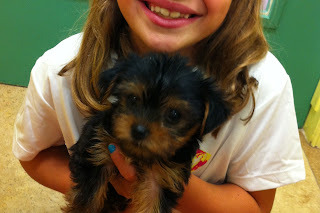 The local Petland allows customers to come in and play with puppies, pet hamsters, parakeets, and rabbits. It is a fun, no cost, and air conditioned activity. If there is not a Petland in your neighborhood, call other pet stores or the local SPCA to see if they welcome visitors to love on their animals. No, "Mom, I'm Bored" today! Family, friends and food – what a winning combination! This weekend was filled with all 3 so I would say it was nearly perfect. Our family gathered to celebrate a birthday and anniversaries. We also met some new friends for school and for camp. Food was an integral part of all gatherings. At a family dinner, we ate this orzo salad (my family is very generous with their willingness to taste test). David fired up the Big Green Egg and made some BBQ chicken; we also had edamame salad and Butterfinger ice cream pie. At our camp get together, Leslie brought a black bean, corn and feta dip with green onions in place of cilantro (a new friend with great taste!) and with it, we drank some lemon mint tea. Hope your weekend was fulfilling too! Toss the orzo with the beans, tomatoes, onion, basil, mozzarella and enough vinaigrette to coat. Season the salad, to taste, with salt and pepper, and serve at room temperature. Or try adding other ingredients like cucumbers, feta instead of mozzarella, prosciutto or grilled chicken. Customize to your tastes! !